Did you miss us? I know the PIX11 Morning News audience did. That’s why, this week, we came back for another “Couponology Corner” segment with gift ideas and a giveaway for Father’s Day. Tommy Hilfiger Comforter Set Winner! Our most recent contest has ended, and this fabulous Tommy Hilfiger comforter set is going to Cladine from Brooklyn, NY. As our winner, Cladine will be getting this beautiful blanket bundle directly from Bedding Style. Unlike our other giveaways, this one had contestants sign up for our email newsletter. During the 05/17 episode of “Couponology Corner” the way to win was announced and our subscription list grew more than you could even imagine. Thank to the exposure from PIX11, along with our social media posts on Facebook, Twitter, Tumblr, Pinterest and YouTube, word traveled quickly. In the hours following the show, we saw the most activity, and that included the very lucky Cladine. Tuning in to the PIX11 Morning News on Thursdays should be second nature to you at this point. Half the time you do, you’ll find us doing what we do best: bringing you the best coupons you can find on the net on our “Couponology Corner” segment! 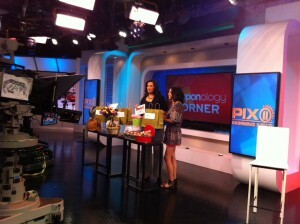 The beautiful couponologist, Krystal Cordova took the stage once again to show off some of the best products you can save on by using our online coupons and promo codes. This week’s show is the first part of a two-part theme for Mother’s Day gifts. “167 million consumers will shop online this year alone, when it comes to Mother’s Day,” according to PIX11 Morning News host Sukanya Christian. Don’t worry about what to get your mom this year, because we have great ideas from top merchants. Take advantage of our coupons for Arhaus Jewels, David’s Cookies and 1-800-Flowers . If you’re a long time follower of our fine blog, you know that we’ve already had Tactics on here. Not as a Featured Merchant or DotW; long before those categories were even put in place. Unfortunately, we lost quite a few posts a few months back. Newer readers deserve to know about Tactics, just like anybody else. Online Coupons, Promo Codes, News and More!